While the U.S. economy has been solidly adding jobs for many months now, the Job Openings and Labor Turnover Summary (JOLTS) released today is another indicator of how much slack still remains in the labor market. 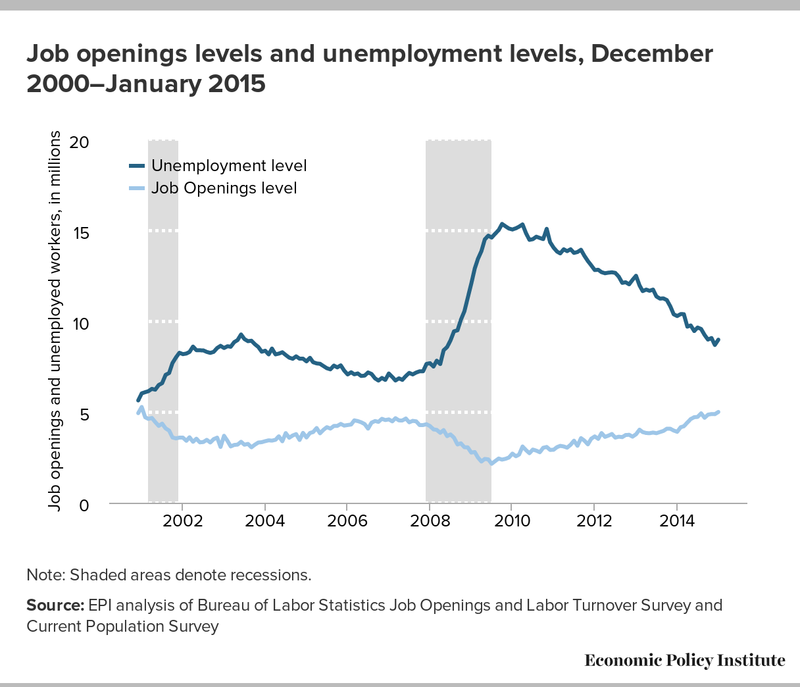 The figure below plots job openings and unemployment levels from December 2000 to January 2015, the latest month of data available. Both indicators are moving in the right direction and have clearly been improving, albeit slowly, throughout the recovery. However, in a stronger labor market, these two indicators would be closer together. The gap is a good indicator of a certain amount of slack. And, it is important to point out that the unemployment level doesn’t include the nearly 6 million missing workers, who have yet to enter or return to the labor force. Another way to look at that gap is to create a ratio of job seekers to job openings. The number of job openings hit 5 million in January, while there were 9 million unemployed workers. Taken together, this means there were 1.8 times as many job seekers as job openings. 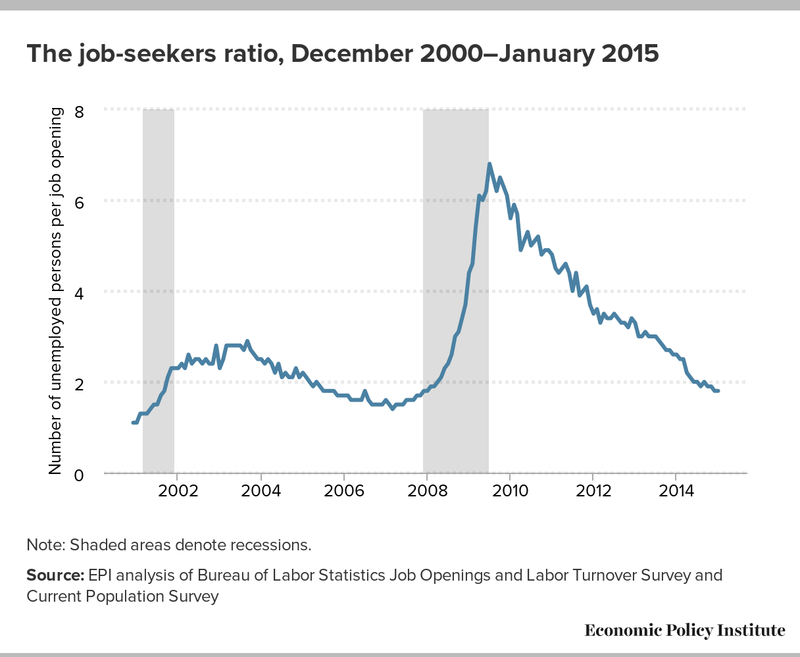 As shown in the figure below, the job-seekers-to-job-openings ratio has been declining steadily from its high of 6.8-to-1 in July 2009. While there has been a clear improvement, it is important to remember that a job opening when the labor market is weak often does not mean the same thing as a job opening when the labor market is strong. There is a wide range of “recruitment intensity” with which a company can deal with a job opening. If a firm is trying hard to fill an opening, it may increase the compensation package and/or scale back the required qualifications. On the other hand, if it is not trying very hard, it might hike up the required qualifications and/or offer a meager compensation package. Perhaps unsurprisingly, research shows that recruitment intensity is cyclical—it tends to be stronger when the labor market is strong, and weaker when the labor market is weak. This means that when a job opening goes unfilled when the labor market is weak, as it is today, companies may very well be holding out for an overly-qualified candidate at a cheap price.